Marine birds or seabirds make their living by feeding off marine invertebrates and vertebrates (aka fish) from the back-bays and estuaries to more than 60 miles from the coast. 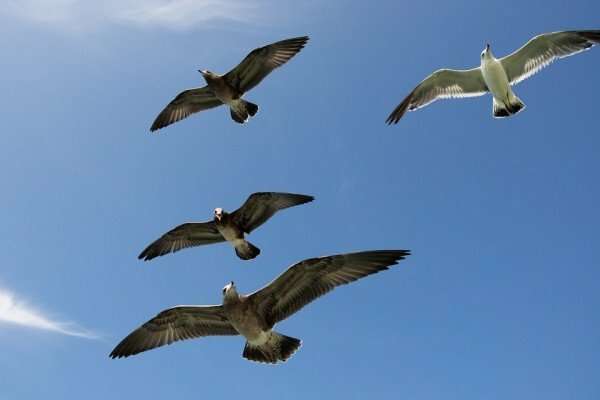 Most seabirds have excellent vision so they can locate their prey from the air. Seabirds generally will feed on a lot of the same species that marine gamefish target, so by identifying and knowing your marine birds, it can help clue you in on the type of baitfish and gamefish that is feeding in the area. Just as the old fishing adage goes, “big baits equals big fish,” indicates the use of over-sized offerings to entice the largest fish in the group. When you see birds on the water, the size of the bird species will generally indicate a size or type of baitfish. Small terns and gulls will feed on smaller baitfish like anchovies, silversides and smelt. Birds of the larger variety, such as gannets and herring gulls will target larger baitfish similar to herring and menhaden. This will greatly narrow down for the most optimal lure selection when targeting a particular species. Seabirds, like all animals, expend energy from a variety of processes (movement, digestion, breeding, etc), so they need to use and conserve energy wisely. For this reason, if they can not locate bait efficiently in the vast open ocean, then they will eventually die due to more calories being expended then replenished. Birds that are flying with their heads scanning the surface are in a “searching” mode, which means they have not located baitfish/gamefish but are actively looking. Whereas a group of birds or even a single bird hovering in the same location for an extended period of time, it will generally indicate some type of baitfish or gamefish activity on or below the surface. When you find seabirds away from shore behaving this way, it is well worth an investigation. This may not necessarily hold true if you’re targeting ground-fish or wreck inhabitants (sea bass, tautog, halibut, summer flounder), but it is vital for mid-depth to surface feeding gamefish (striped bass, bluefish, tuna, wahoo, billfish, etc). It is advised to go out and purchase a good, quality pair of binoculars especially if you will be targeting mid-water to surface feeding fish, and make sure you leave them on the boat. A quality pair of binoculars and a working knowledge of seabirds in your area will help you put more fish on the line. Petrels & Shearwaters – Generally offshore species – Tuna, Shark, Billfish, Cobia, etc. Black-backed/Herring Gulls & Gannets – Generally inshore species – Striped Bass, Bluefish, Sharks, etc.